MotoCzysz announced today their team lineup and plans for racing in the 2013 season. It included the expected visit to the Isle of Man for the TT ZERO at the end of May, but a very welcome move to participate in the eRoadRacing series. The team lineup is full of top racers, namely: Michael Rutter and Mark Miller for the TT ZERO, and Shane Turpin and Steve Rapp for the eRoadRacing series. The team goals for 2013 are quite ambitious, but I think achievable. At the TT ZERO they hope to break through the 110 miles/hr lap speed. At Laguna Seca they plan to not only win the race, but to hit lap times really close to MotoGP times. They have some big goals for themselves, and doubtlessly they'll have seriously improved their bikes for this year. Their competitors haven't been sitting still, however. 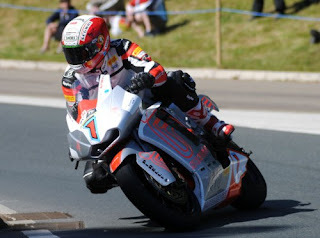 Michael Rutter rode with MotoCzysz at the TT ZERO in 2011 and 2012, winning the race both times. In 2012 he and team-mate Mark Miller both broke the 100 miles/hr lap speed. “With two wins under my belt, I’d like to go for the hat-trick this year and with Team MotoCzysz providing the equipment, I think we can get it done,” said an enthusiastic Rutter. Mark Miller has ridden with the team since 2010, winning the race that year. “The team and I have shared many memorable moments over the years and I look forward to being surrounded by my extended family again at the Isle of Man TT and to ride the latest permutation of their mind-blowing e1pc," said Miller. 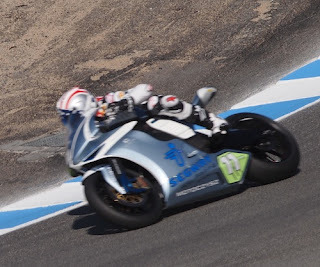 MotoCzysz has also raced in TTXGP and FIM e-Power events at Laguna Seca, on the MotoGP weekend. In 2010 Michael Czysz rode, beating Lightning Motorcycles by a nose. In 2011 Czysz rode again, beating Lightning again by a nose. In 2011 they also came to the TTXGP North American final at Miller Motorsports Park, and with Shane Turpin riding they beat Lightning by a much wider margin. "I've raced everything from Singles to Superbikes, but nothing as special as the MotoCzysz e1pc,” stated Turpin. “The Czysz group is truly leading the world in electric-bike technology and that has been proven in race results and in lap times that are rivaling conventional bikes. Anyone skeptical of electric-bike technology needs to see this thing run!" A few paragraphs back I suggested their competitors haven't been sitting still. That's a part of racing, that the teams are always striving to best each other. At the TTXGP 2012 World Championship, Brammo's bikes were hitting 170 miles/hr in race conditions, a huge improvement over just a couple months earlier. We won't see until some of these teams get into a race against each other, but I'm expecting that Brammo, Lightning, and MotoCzysz will have each upgraded their performance in a big way for 2013, and that the Laguna Seca race is going to be even more awesome than any previous instance of that event. The MotoCzysz press release does not commit to anything in the eRoadRacing series other than the Laguna Seca event.